Learn the Arthroscopic repair of acute Acromioclavicular Joint Separation with the Arthrex TightRope system surgical technique with step by step instructions on OrthOracle. Our e-learning platform contains high resolution images and a certified CME of the Arthroscopic repair of acute Acromioclavicular Joint Separation with the Arthrex TightRope system surgical procedure. AC joint injuries are common (approximately 9% of shoulder girdle injuries) and usually are the result of direct trauma to the point of the shoulder. Falls whilst cycling, skiing or contact sports are common examples. Radiographic evaluation of the AC joint is performed with standard AP and axial views of the shoulder. The axial view allows for evaluation of the anterior/posterior position of the distal clavicle with respect to the acromion. The Zanca view, however, provides improved visualisation of the AC joint and is performed by tilting the x-ray beam 10° to 15° toward the cephalic direction and using only 50% of the standard shoulder anteroposterior penetration strength. Standard shoulder radiographic penetration will overpenetrate the less dense AC joint. Stress views were commonly requested mainly to differentiate between a type II and type III AC separation. However cannot be recommended due to the discomfort to the patient and the high rate of false negatives seen from muscular spasm. A clinically significant AC separation can easily be demonstrated on routine AP views and on examination of the patient. The AC joint is stabilized by static and dynamic stabilizers. The static stabilizers include the capsule and AC ligaments (superior, inferior, anterior, and posterior), the coracoacromial (CA) ligament, and the coracoclavicular (CC) ligaments (conoid and trapezoid). The dynamic muscular stabilizers include the trapezius and deltoid. The classification of AC joint instability reflects the sequential loss of AC stabilizers and is useful in directing treatment. A grade I injury involves a strain of the AC ligaments only. A grade II injury involves disruption of the AC ligaments but the CC ligaments are intact. In a grade III injury both the AC and CC ligaments are disrupted but the deltotrapezial fascia is intact, and displacement is <100%. In a grade IV injury the AC and CC ligaments are disrupted and the lateral clavicle is displaced posteriorly into or through the trapezius muscle. 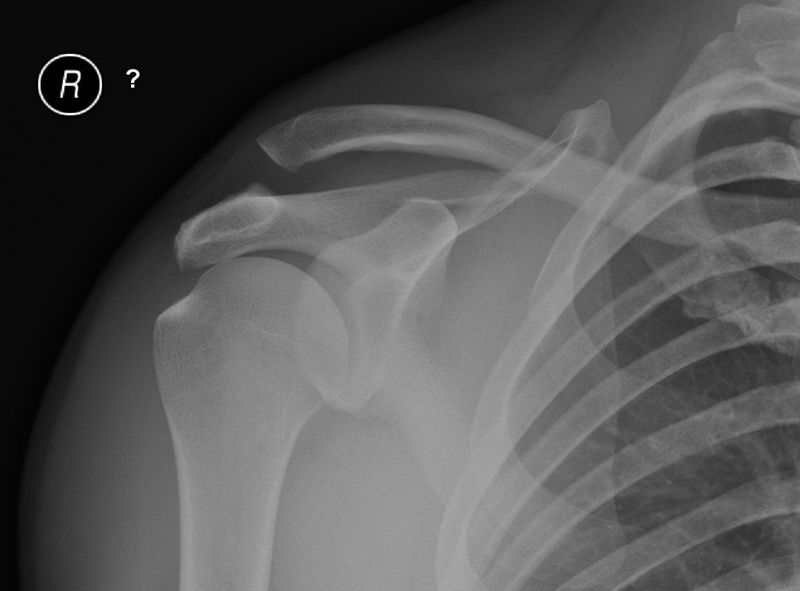 Type VI injuries are very rare and represent complete AC dislocations with the lateral clavicle displaced inferior to the coracoid and the conjoined tendon.